• Same day drop-off & pick-up to your driveway, loading dock, parking lot or yard. • Weekend dumpster rentals in Silver Spring. • 10-yard, 15-yard, 20-yard or 30-yard selections to rent an Maryland dumpster for face-lift or renovation projects. • Speedy and polite service from knowledgeable and qualified drivers. We Got Dumpsters is dedicated to satisfying all your Silver Spring dumpster rental requirements. Whether you are adding an addition on your home or expanding a business, our drivers will arrive in a timely manner per your request. When you hire the services of We Got Dumpsters, you will get quick service, efficient dumpster rentals MD for renovations for year around service. Our partners are located near the transfer station, which means smaller travel times between trips when you need multiple rent a dumpsters for MD renovations. Plus, we use small but rugged trucks to move your dumpster, which helps us route small spaces and prevent harm to your property. Our best feature… our Silver Spring MD dumpster rentals are intended to be low-impact on your home or business. • We have been assisting our customers with renovations for more than 20 years. • We Got Dumpsters is locally owned and operated. • Our dumpster delivery partners are fully licensed and insured, giving you peace of mind during your rent s dumpster drop-off or dumpster pick-up. Despite these various services offered… we have succeeded in keeping our dumpster rentals affordable. When you call our office at (301) 328-2001 to order an MD dumpster your restorations, you will speak with a local team member that understands your needs & community. If you need dumpster rental services in Rockville, Silver Spring or any of the neighboring areas in DC, MD or VA... Please give us a call today! We Got Dumpsters is here to offer Silver Spring a dumpster rental that will not break your budget. We offer low affordable rates with no hidden costs or extra charges. Please contact us at (301) 321-2001 for our all-inclusive dumpster rental quote. You can rest assured knowing you’re renting an affordable dumpster at a great deal with We Got Dumpsters. • Dumpster rental sizes available in the Washington DC Metro area: 10-Yard, 15-Yard, 20-Yard and 30-Yards. • Our pleasant and helpful customer service team will help you set-up with the right dumpster rental in Silver Spring for your job. • We offer speedy deliveries and pickups to and from residential and commercial localities. • We will appropriately dispose of construction, household and heavy debris or junk…including dirt and concrete. One of the many bonuses of working with We Got Dumpsters is that we several deliver options for your waste management needs. We offer dumpster rentals in Silver Spring that come in several dimensions. We Got Dumpsters can deliver to most any residential, commercial or construction location. No matter what your debris removal or junk cleanup plan entails… We have the dumpster near you to handle your job. From small home clean-ups and clean-outs to major interior restorations or roof replacements. You can lease a dumpster to swiftly dispose of residential or construction junk. Merely just giving us a call and find the right roll-off garbage dumpster for your job. 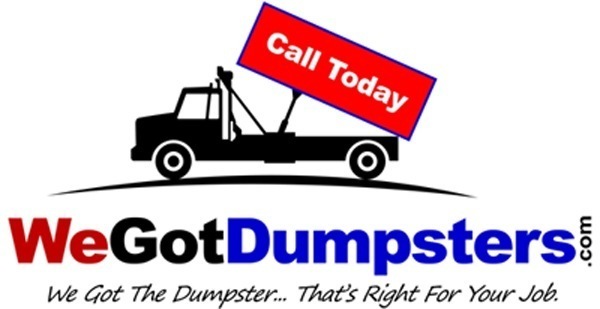 If you are looking for a Dumpster Rental for Junk Removal in DC MD or Northern VA? Try our All-Inclusive Pricing at We Got Dumpsters. Our Rent A Dumpster serves Washington DC Maryland and Virginia. When the time arises for a Roll-Off Container or Dumpster Rental… You can Trust We Got Dumpsters. In addition to helping our customers become cost-effective… our goal at We Got Dumpsters is to offer clients affordable roll-off dumpsters that fits their budgets. Whether you are a homeowner, contraction site or business owner… we strive to get you the precise dumpster at an affordable cost. Our roll-off dumpster services transparent and reasonably priced dumpster service, we offer all-inclusive pricing fitting into most any budget. All rates include delivery, pickup, disposal, local taxes and a long rental period. Our prices are discussed up-front so you know precisely what you are paying. Call (301) 328-2001 Today and see how much you’ll save on your rental a dumpster in Silver Spring.